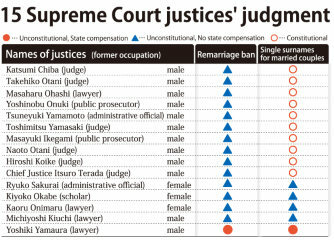 The Supreme Court's Grand Bench ruled on Dec. 16 that the Meiji-Era Civil Code provision banning the use of different surnames by married couples was constitutional, while another provision banning women from remarrying for six months after divorce was unconstitutional. Plaintiffs in the lawsuit and others had called for rectifying the two Civil Code provisions, arguing that the concept of "discrimination against women" is embedded in the rules based on the pre-war "family system." The Grand Bench of the top court drew different conclusions on the two Civil Code provisions, suggesting that decisions over the family system should be made in line with changes in social conditions and time. 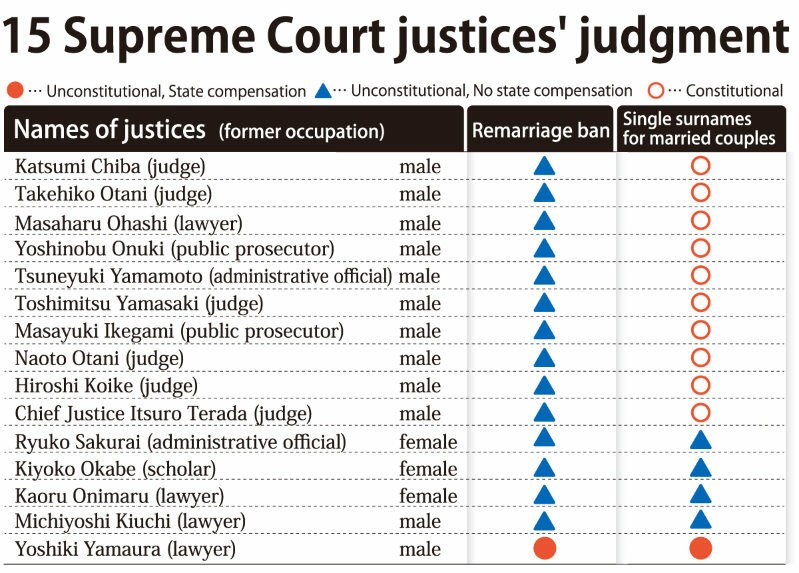 Both of the two Civil Code provisions originate in the "family" system stipulated in the Meiji Constitution. In its first-ever ruling over the constitutionality of the issues, the Grand Bench of the Supreme Court acknowledged that there is rationality in the legislative purpose itself of the provisions. On that basis, the top court made decisions while paying attention to how the meaning of the provisions has changed over time and comparing disadvantages and advantages stemming from the existence of the provisions. Plaintiffs in a lawsuit over the remarriage ban period pointed out changes being brought on by "developments of medicine and science and technology." The period for prohibiting women from remarrying was set for the purpose of preventing trouble over determining who is the father of a child delivered by such a woman. In the Meiji Period, there were no means other than simply assuming who was the child's father. But today, it is possible to determine the biological parent-child relationship with extremely-high accuracy if DNA analysis is carried out. The state side disputed the plaintiffs' argument, saying, "They (women) should wait six months to remarry so that anyone can see (to whom their children belong)." The Grand Bench of the top court gave weight to clear changes taking place in the fields of medicine and scientific technologies. The court then concluded that the period for banning remarriage after divorce exceeding 100 days is unconstitutional, stating, "There was meaning in having a six-month period in an age when even experts could not determine women's pregnancy, but it is now difficult to justify that." Supplementary opinions provided by six justices called for the state to contrive operations of the Civil Code provisions. Citing the fact that elderly women are allowed to remarry and other women are also allowed to remarry their former husbands during the remarriage ban period even today, the justices said, "In cases in which it is medically clear that women are not pregnant at the time of divorce, they can be treated similarly." Meanwhile, the Grand Bench of the Supreme Court, which ruled that the Civil Code provision banning the use of different surnames by married couples was constitutional, said, "There is rationality in requiring single surnames as a means of evoking a family as a collective unit." Furthermore, emphasizing changes in social conditions in recent years in the form of women's social advancement and rising awareness of gender equality, the court said, "There is no denying that women feel a sense of loss after changing their surname or they suffer disadvantages in their personal confidence or evaluation." Thus, the top court weighed the advantages and disadvantages of the same surname system. In reference to the fact that the majority of couples pick their husband's surname, the Supreme Court said, "It can be presumed that there are many cases in which the women who are to become wives suffer disadvantages." At the same time, because the use of women's original maiden names is widely recognized at private companies and other workplaces, the top court said that their disadvantages are "being alleviated to a certain extent." Thus, the top court did not judge that the infringement of rights by the same surname system was unconstitutional. However, there is no guarantee that the Supreme Court's decisions will remain unchanged in the future. Of the 15 justices, all of the three female judges said the Civil Code provision banning the use of different surnames by married couples was unconstitutional. They said, "There has emerged a situation where it is difficult to identify individuals because of surname changes." As for the reason why an overwhelming majority of couples choose the husbands' surname, they said, "It has been caused by weak social and economic positions of women and social pressure." Two male justices also said the provision was unconstitutional. One of them said, "The Diet failed to make legislative efforts." He said the state should be held responsible for damages. If debate on the introduction of a separate surname system were to intensify further, the top court's decisions could be overturned.